The streets surrounding Wall Street are some of the oldest in the city. They occupy a special significance in American history, as so much happened in just a few city blocks. From the first Dutch settlers to the high stakes action of the Stock Market, New York is a city built on commerce, and Wall Street is its heart. We learned so much from Jon White. Not just the history, but the real boots-on-the-ground view of the world of investment. Jon gave us a clear understanding of the financial meltdown and how to avoid the noise of financial information and get to the real indicators. I was seriously impressed with George's knowledge and his ability to convey it to a mixed group,It is one thing to wander around the buildings in the Wall Street area without knowing what goes on there but quite another to walk around with George and hear about the inside story. Our guide, who had great knowledge, used to work for the NASDAQ company and was spicing up the informative tour by adding personal experiences as we walked along. Historically reviewing the development of New York's Financial District until today... He gave an insight on typical Wall Street culture and common practices while elaborating on things such as the atmosphere on a trading floor. There are a lot of interesting things that you would never find out about unless you had a knowledgeable guide... His background as a trader allowed him to give an informed and thorough account of Wall Street culture, attitude, and lifestyle. As we had a small group Sandy also threw in some bonus trivia for us to enjoy. Sandy also added in relevant content for all of the international guests which made it even more enjoyable. The tour was not too heavy so it is ideal for those who are interested in the Wall Street history, but aren't armed with a huge background in finance or stockbroking, like myself. We got a tour guide who happens to be a true New Yorker and have worked in the industry all his life. His knowledge about the area and the city is a very pleasant bonus to our visit. My college kid and my teenager got a chance to watch a New Yorker at work, and learned about Wall Street, New York. They enjoyed him and his work of art. Keeping three teenagers interested on a hot Sunday afternoon takes some doing and Sandy not only achieved this but gave the 5 of us a fascinating insight into the evolution of Wall Street to the recent highs and lows. His use of props in terms of historic pictures helped us get more from the tour than simply listening to a good speaker and Sandy's total enthusiasm is infectious. Received an extremely interesting and informative tour from Jared. Knew a lot about the history of wall street - not just the financial aspect but provided a lot of insight about the history and politics of the area. Highly recommend him and this tour. Jared if you're reading this, thank you! Jon White was a warmly personable and informative guide who presented an intriguing overview of the history and personalities of the Financial District. Jon answered individual questions from his very extensive background in the financial world. I brought my nephew... He's a college student majoring in finance and accounting. I'm was an Econ major and worked a long time as a financial analyst. For both of us, the tour was excellent - a great blend of enough finance, plus lots of interesting history, interesting details, and it hit all the spots I hoped it would. Tom was our guide and he was fantastic! The tour was a nice balance of finance info, current affairs and history. Very informative and interesting. Truly a highlight of our first trip to NYC! 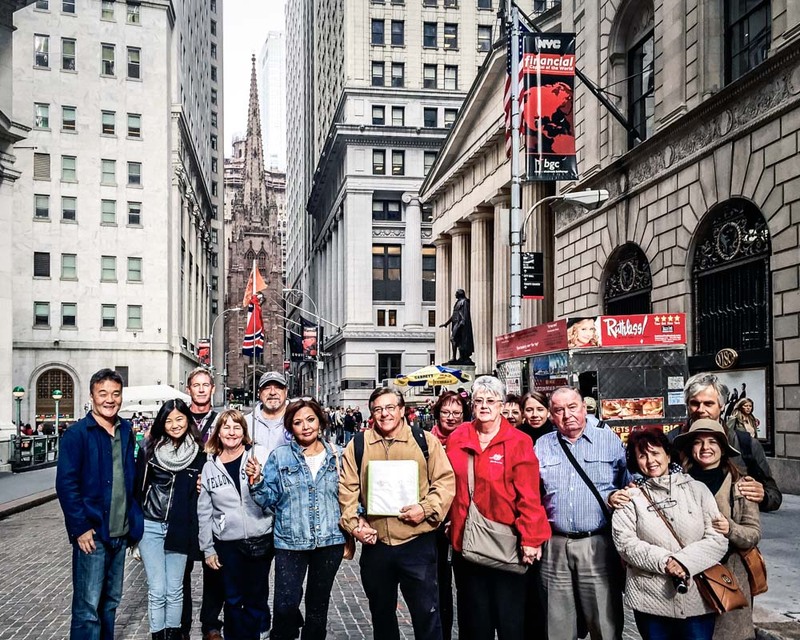 How are The Wall Street Experience tours different than others? These are the only tours designed and guided by Wall Street insiders, which provides first-hand accounts of Wall Street. If you want this additional depth of experience, these are the tours for you. 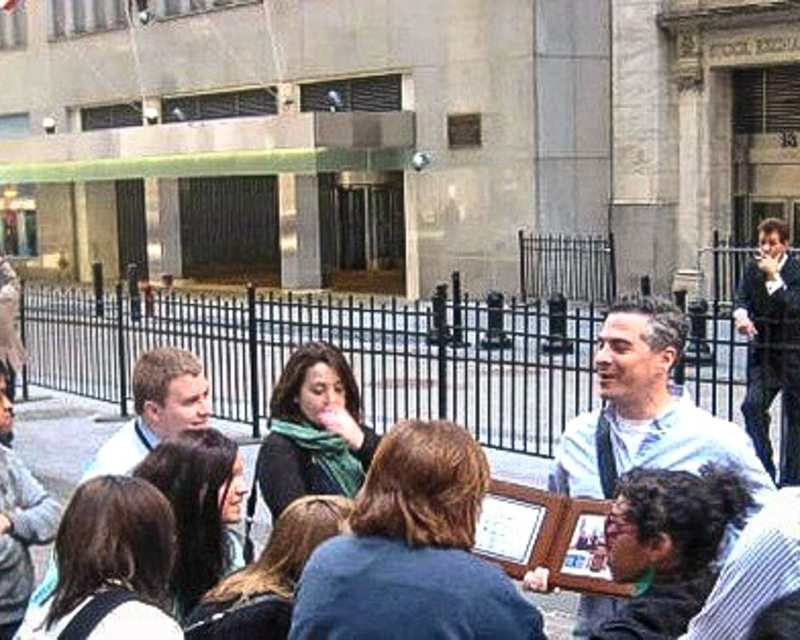 No other Wall Street tours have our depth of content and relevance. Our guides have managed billion dollar trading businesses, taught economics at MIT and written for finance and trading publications. This is why Oliver Stone filmed us for the Wall Street 2 Movie DVD feature and why leading financial institutions such as Bank of America, Credit Suisse, and MF Global, as well as leading universities including UPenn and Columbia selected us for their group events. The stories we tell, the answers we give and the interaction we can create is the difference. Will I enjoy these tours? We find those with an appreciation of finance and understanding of current events enjoy these tours more. You do not need to have a financial background as we don't assume that our audience does. Our tours are narrated without finance lingo. These are interactive tours and questions are encouraged. Check out the testimonials. Do we go inside the New York Stock Exchange? No, since the NYSE has been closed to visitors since 2001. If the weather is cool you may want to bring warm clothes as this tour takes place outdoors. It can be particularly windy in downtown Manhattan. If the weather is warm, you may want to bring something to drink. Feel free to bring a camera. It is best to use the bathroom before the tour. There are no planned bathroom stops. However there are public restrooms along the way. Does the show still go on if it rains? Yes, the tour will go on unless severe weather prevents your enjoyment. If we cancel the tour, you can reschedule the tour. Please contact us to find out if a tour is cancelled due to inclement weather. We will refund the ticket if we cancel the tour. Are baby strollers, wheelchairs allowed? Approximately 1 mile or 1.6 kilometers over 2 hours for the Financial Crisis Tour. While there are no hills, there are some steps. The tour will end near our starting point. Yes, but only if you share with the rest of us. No dress codes required. You should dress in comfortable clothing. If the weather is cool you may want to bring warm clothes as this tour takes place outdoors. It can be particularly windy in downtown Manhattan. In the wintertime, DEFINITELY bundle up, wear extra layers and hats and gloves. Can I reschedule or refund my ticket? Yes, you can reschedule or transfer your ticket. You can refund your ticket if you let us know 48 hours before your tour. Can I purchase the ticket at the tour? Please purchase your tickets online in advance. We cannot guarantee availability at the tour. to Wall Street. Walk 1 block over to Broad Street. to Fulton Street. Walk 6 blocks south to Broad Street. to Rector St. Walk 3 blocks east to Broad Street and Wall Street. By Car: Click here for a map of nearby paid parking spaces. Not recommended due to unpredictable traffic which may cause you to miss the tour. Tour Bus Loading/ Unloading and Parking: Click here (opens in a new window) for DOT's permitted tour bus map in lower Manhattan. Tour Ends: Federal Reserve Bank on Liberty Street and Nassau Street, about 5 blocks from the meeting location. Guided by Wall Street insiders, you will see world-famous financial landmarks such as the New York Stock Exchange, Federal Reserve, and Wall Street. While meandering the narrow, winding streets of Lower Manhattan, you will hear exclusive stories from "inside the trenches" that will entertain, inform and shock you! Come with us and explore the beginnings of the Big Apple. Stand on the steps near where George Washington was inaugurated as president. Feel the lingering scars of New York’s first tragic terrorist attack, and hear how a well-intentioned cleanup allowed the criminals to escape detection for over a hundred years. This is a less intensive version of the Financial Crisis tour and recommended for a general audience. Please note this tour does not go inside the New York Stock Exchange which has been closed to visitors since 2001.